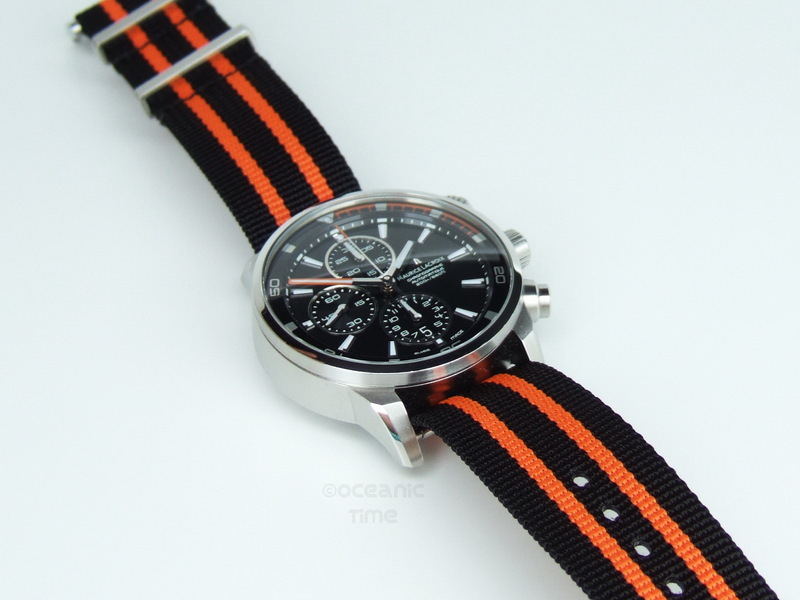 BACKGROUND First established in 1975, Maurice Lacroix is a relatively young watch brand. 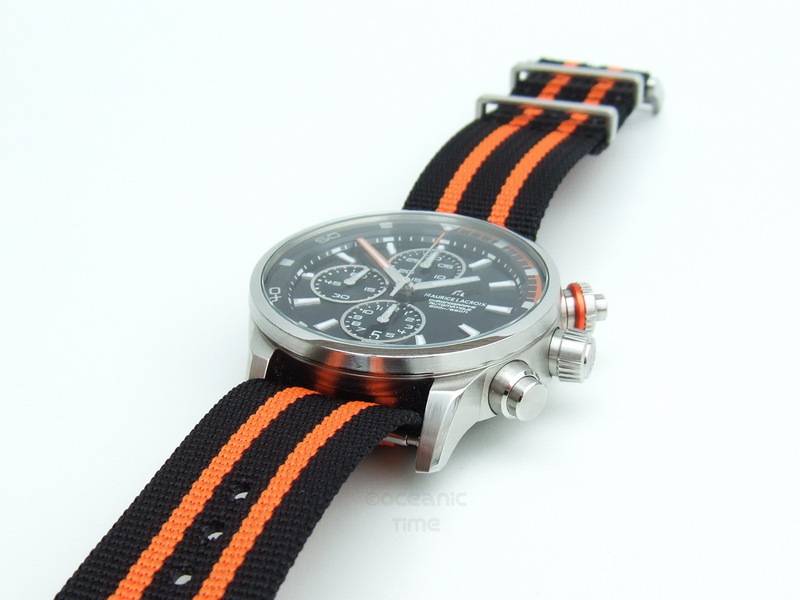 They have been focused on the development of mechanical wristwatches since the early 90s. In 2006 they made the leap to become an exclusive Swiss Manufacture producing complex in-house movements and components with a focus on retrograde displays, chronographs and moon phase indications. I couldn't say that ML has ever come up on my radar in terms having a particularly noteworthy divers’ model until the new Pontos S came out. However, prior to it they had a model called the Miros Diver. A 200m, three hands automatic with a fairly generic design, but by no means unattractive. One of the things that I really liked about it was its dial, but that's another story! AESTHETIC The Pontos S blends contemporary and vintage styling to create a look that is modern and sporty. The military style nylon strap gives a very striking burst of color, which really brings the watch alive. If you find the orange a little showy - pop the watch back on its steel bracelet for a more subtle look. 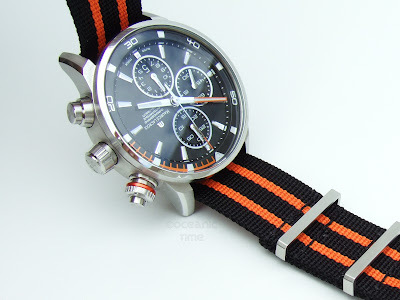 The Pontos S is the kind of watch that will appeal to those who like dressy divers with retro styling. DIAL A clean and well balanced dial layout that is easy to read. I particularly like how each of the components complement each other. 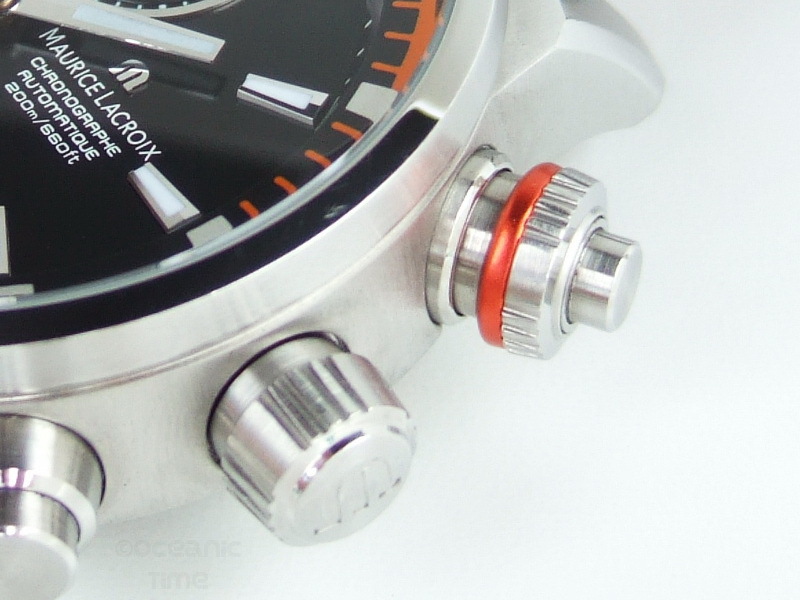 For example, how the design of the applied polished hour markers echo those of the diamond-polished hour hand and those of the three sub dials; whilst the orange of the minute hand captures the diving spirit of the watch. 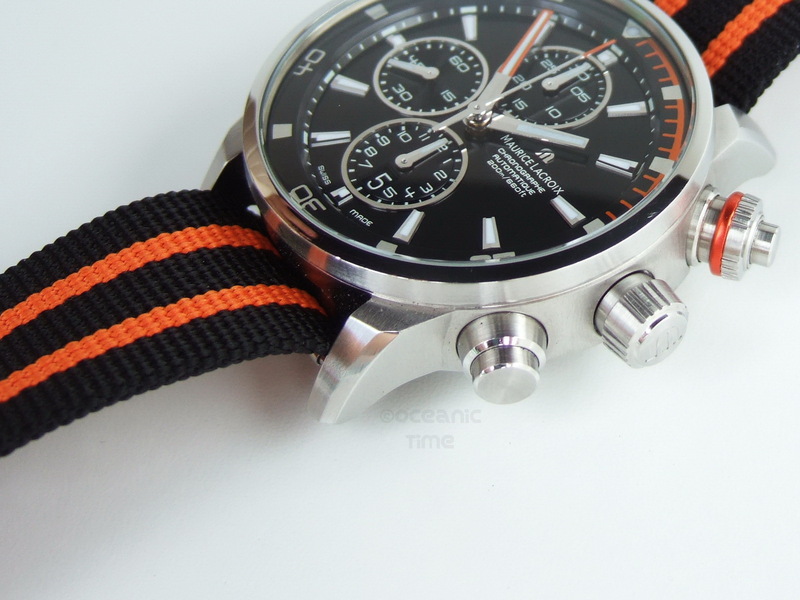 Despite its numerous features the dial remains relatively uncluttered and defined. The minute / second markers have been carefully positioned on the sloped wall of the chapter ring, just enough so that they can be read, but not so much so as to be a distraction. I love how the date wheel blends seamlessly in with the counters of the sub dial at 6 o’clock. It’s almost invisible yet is clearly legible once you know it’s there (not sure if that makes sense or not). ML have executed a design that shows great thought and care, and attention to detail! 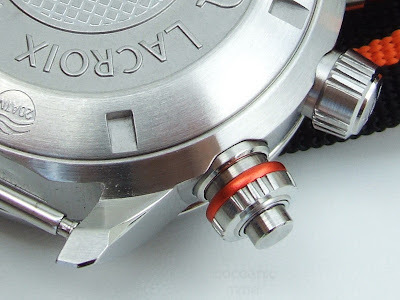 internal BEZEL The Pontos S features a brushed aluminum internal bi-directional rotational divers bezel with an elapsed dive-time scale in five minute increments. The scale running between ‘0’ and ‘15’ is in orange. It doesn’t quite match the orange of the anodized chrono pusher or that of the strap. 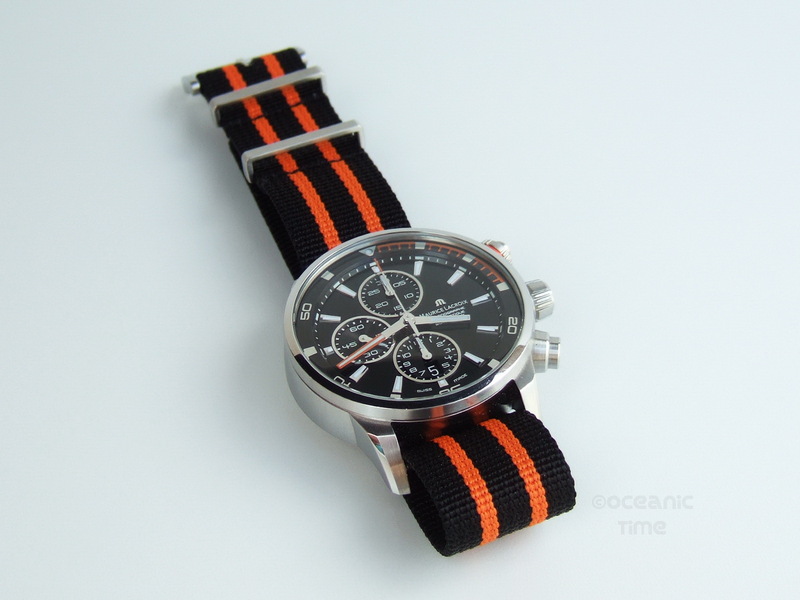 In fact none of the orange on the watch seems to quite match up? There's a triangular 12hr luminous pip for marking dive time. The bezel is operable via a special crown and chrono pusher working in combination, an ML original feature of which a patent has been filed. Its shape was specially designed for an easy grip, however it might be a little fiddly to use with a divers glove. To operate the bezel, simply press down and wind. CASE The 43mm case has been constructed from Stainless steel. It has a simple round design with downwardly curving lugs. 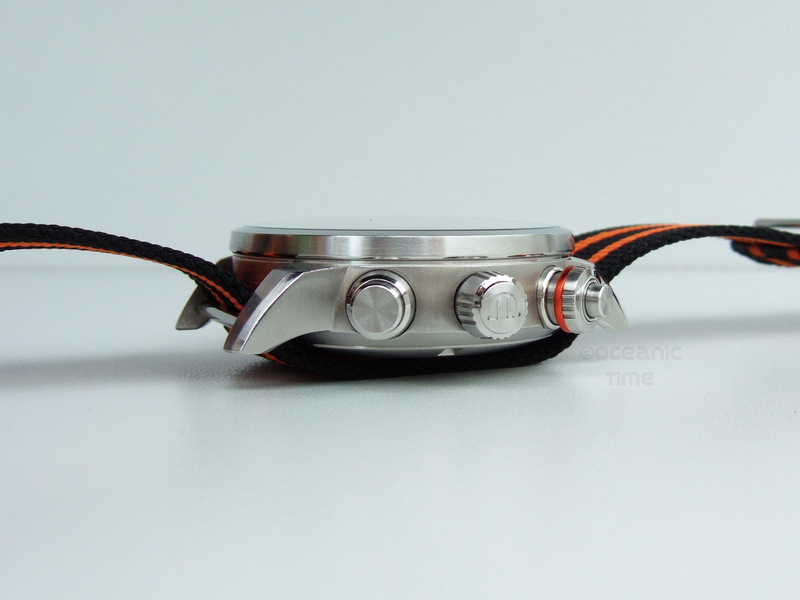 The lugs have been beveled and polished on their sides as has the top of the fixed bezel. The rest of the case has a light brushed finish. The more predominant feature of the Pontos S is its dial; the case design seems to respect this and is therefore understated. CROWN The Pontos S has a signed screwdown crown. It is nice and sturdy. With each function you get a nice little click to let you know you’re there, but you need to give it a bit of pull for the time setting mode. CRYSTAL The watch is fitted with a Sapphire crystal with anti-reflective coating on both sides. The crystal has a very slight dome to it which works well with the slight curve of the bezel. 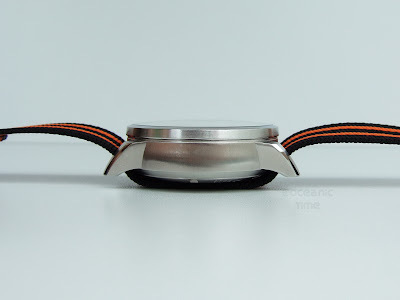 Because this is an internal bezel diver, the dial to crystal ratio is very favorable, which means you get a lot of crystal and a lot of dial making for easy reading. 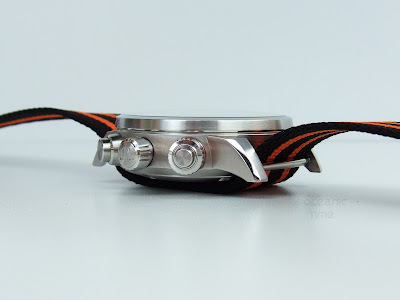 CASEBACK The Pontos S is fitted with solid steel screwdown caseback that has a slight dome to it. It has a simple design with grid pattern engraved into its inner most central portion with a clearly defined ‘Maurice ‘M’ Lacroix’ text surrounding it and then a lightly engraved ‘Pontos S’ text. If any diver was going to have an exhibition caseback then this would be it. So it’s a shame that it doesn’t have one then! MOVEMENT The Pontos S is powered by a ML112 Caliber base Valjoux 7750 automatic movement with custom ML signed rotor, rhodium plating, 25 jewels, 28,800 vib/h and 46 hours of power reserve. 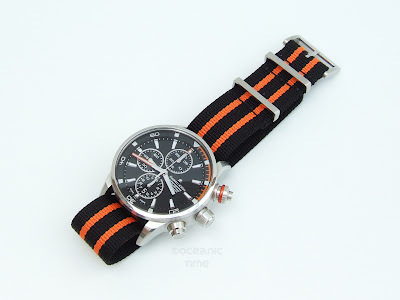 Functions include: hours, minutes, sub-seconds, date and chronograph. 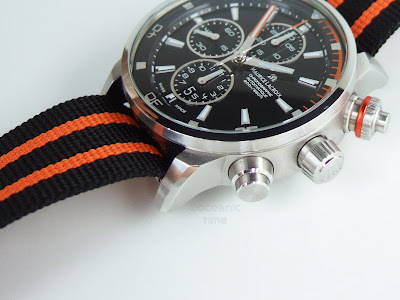 WATER-resistance The Pontos S is water-resistant to 200m or 20 ATM. Water-resistance probably wasn’t high up on ML’s list of priorities when they designed the Pontos S however 200m is still a satisfactory depth rating according to most regulations for divers watches. STRAP The Pontos S is supplied with both a solid steel triple-row link bracelet with; double security folding clasp and wet suit extension (not shown in this review) and a nylon NATO strap made to color match the dial. It is fitted a lovely with ML signed steel buckle and dual steel keepers. 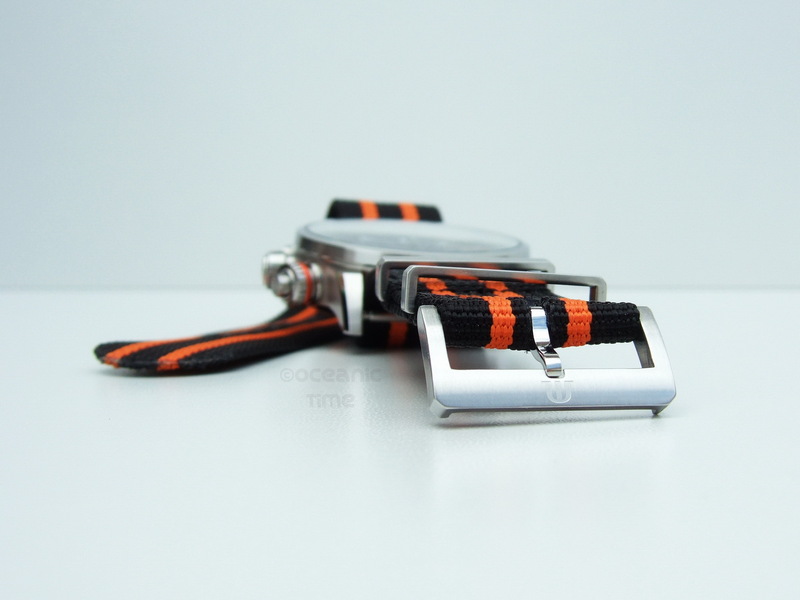 The NATO is very nice, but it’s just a piece of nylon at the end of the day, but I’ve yet to come across one with such a beautifully finished buckle. LUME The Pontos S has Swiss SuperLuminova applied to hour markers, hour and minute hands, and each of the hands of the sub-dials as well as the 12hr pip of the internal bezel. I would rate the lume at average to good. 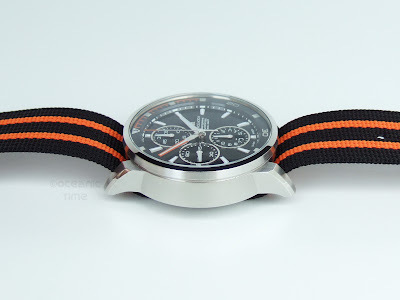 on the WRIST Because (for me personally) the Pontos S is so small and light it is extremely comfortable on the wrist. I really didn’t notice it there. Admittedly I have only worn it on the NATO. The NATO is also extremely comfortable to wear. I believe nylon is hypoallergenic so that it won’t react with your skin. I am not sure of the exact height of the watch, but it slid easily under a shirt sleeve. 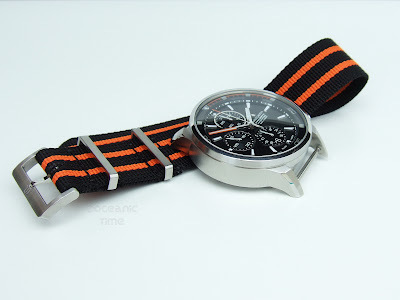 In short most wrists should happily accommodate the Pontos S.
BUILD The Pontos S is a beautifully made watch. The case as well as its components have all been very nicely finished, every last component fits just as it should do. The dial has been flawlessly executed, text is crisp and clear all components perfectly aligned. I couldn't find fault with it! 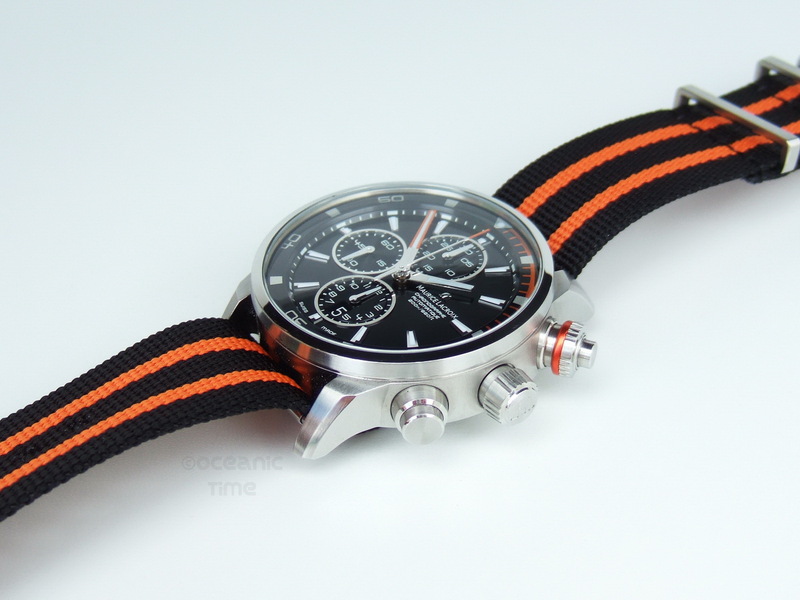 VALUE The recommended retail prices for the Pontos S are: 4’400CHF / 3’450Euro or 4100USD. It’s hard to calculate its true value because I have little to compare it to, so I guess it comes down to the strength and reputation of the ML brand and what that means to you personally. 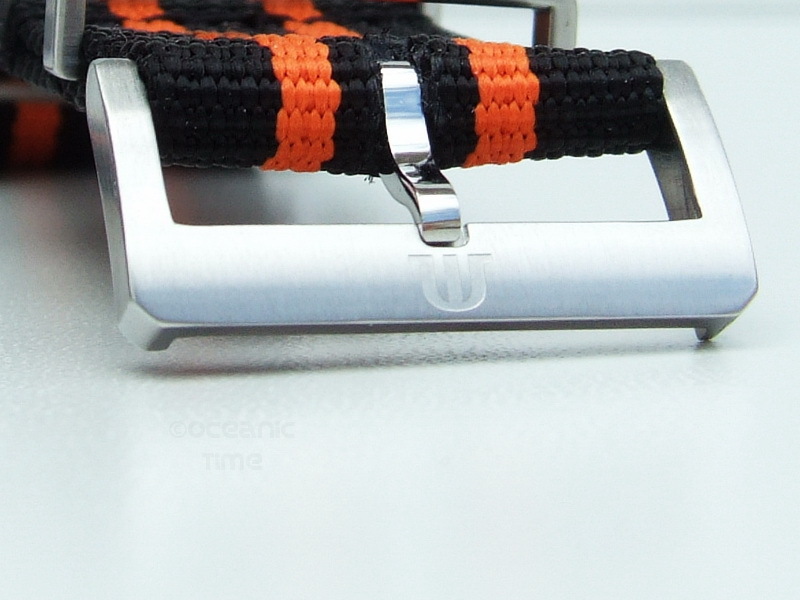 Don't forget that the watch is actually supplied with a steel bracelet. also CONSIDER Maurice Lacroix have created something unique, so I couldn’t really compare the Pontos S to much else. 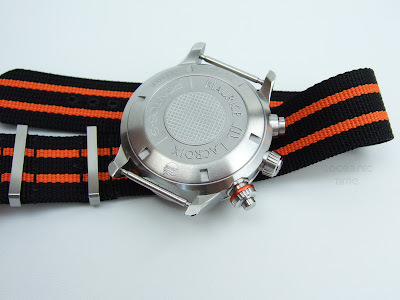 But a worthy contender would be the Hanhart Primus Diver, which is a little more affordable, but has similar features (bezel aside) and is of a similar character. 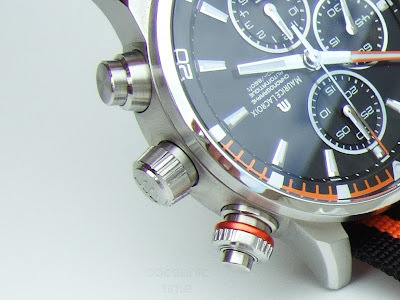 If you have more to spend and must have an internal bezel diver with a chronograph caliber, then you won’t do much better than the IWC Aquatimer Split Minute Chronograph from the previous generation of Aquatimers. If you’re on a tight budget you might consider the Chino-Swiss made Golana Aquapro Chrono. As soon as I clapped eyes on the Pontos S, I knew immediately that it would be a hit. 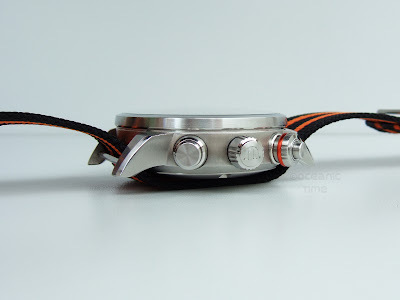 It had a design that was unlike anything else I had seen, but that also ticked all the right boxes in terms of an appealing dive watch design that you wouldn’t grow bored of. 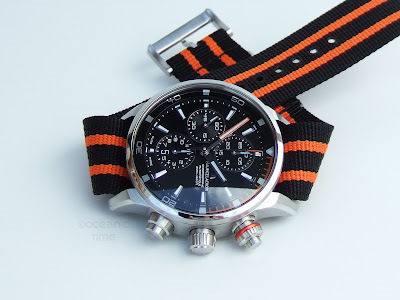 I mentioned this earlier, but for me the Pontos S is all about its lovely dial, which has been so beautifully accentuated by a simple military strap. 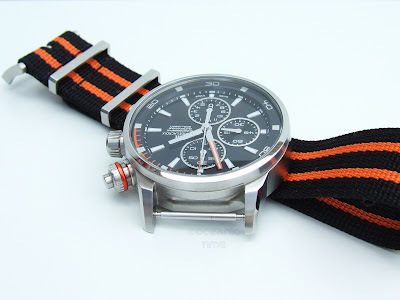 The fact that ML had also innovated with a new bezel and chrono operating system made the watch all the more appealing. It’s not really a dive watch in the sense of being a big solid diving tool, but it captures the diving spirit remarkably well. And not necessarily in a ‘let’s venture into the abyss’ kind of way, but more in a composed and dignified ‘let’s check out some coral and fishies' manner, which it does whilst maintaining a keen sense of style and good taste!